Several entertaining fights highlighted the untelevised undercard for two-time Olympic gold medalist Claressa Shields defense of her WBC and IBF titles against mandatory challenger Tori Nelson at the Turning Stone Resort Casino in Verona, New York tonight. 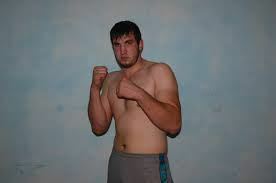 In the main supporting bout, Detroit via Kurchaloi, Russia, heavyweight Apti Davtaev had a successful United States fighting debut by scoring a six-round unanimous decision over Philadelphia’s Garrett “The Ultimate Warrior” Wilson. Wilson didn’t make it easy. Fighting out of a crouch, the heavily muscled, but much shorter Wilson came up with enough wild haymakers to make the entire fight very interesting. Davtaev appears to have a heavy right hand, which he dropped onto the hard head of Wilson often enough to earn the close, but deserved nod. Davtaev warrants credit for going to war whenever one of Wilson’s looping swings connected. Davtaev (now 14-0-1, 13 KOs) loses his perfect KO percentage, but walks away with a hard-fought victory over a foe who came to win. Wilson is now (18-14-1, 9 KOs). The scores were 58-56 from all three judges. An accidental headbutt brought an abbreviated end to the six-round super lightweight return of Aktjubinsk, Kazakhstan’s Bakhtiyar Eyubov. In against Lynchburg, Virginia’s Maurice Chalmers (14-13-1, 8 KOs), the exciting slugger Eyubov (13-0, 11 KOs) was advancing behind active head movement and a tight shell when his head collided with the retreating Chalmers’. The cut that resulted was ruled too severe and the fight was ruled a No Decision at 1:59 of the opening round. In a wild women’s light heavyweight brawl featuring fists flying from every direction, wrestling holds and several MMA-style takedowns, Franchon “The Heavy Hitting Diva” Crews-Dezurn won a unanimous six-round decision over Tiffany “The Terminator” Woodard. Crews-Dezurn, now 3-1, 1 KO, of Baltimore, Maryland, had too many weapons for Wilson, North Carolina’s Woodard (now 4-10-3, 3 KOs), so Woodard tried and succeeded to make things ugly. What followed was a wild punch-out featuring elbows and headlocks and takedowns that left both on the canvas more than once. Woodard took a lot of hard leather and deserves credit for her toughness. Crews-Dezurn showed class in not taking the bait for most of the fight. She did lose a point in the sixth for a sneaky revenge takedown. The scores were 59-53, 59-54 and 59-54. Detroit via Magnitogorsk, Russia’s Alexey Zubov outworked a determined Lamont “Too Smooth” Capers of Hawley, Pennsylvania, on his way to a six-round majority decision. An entertaining fight between hard-nosed cruiserweights, Zubov was cut over the right eye and took some good punches, but simply outworked the more selective Capers. Zubov showed his often-superior conditioning and worked behind an educated jab, while Capers was content to lay on the ropes and land hard pot shots often enough to keep it interesting. A score of 57-57 draw was over-ruled by scores 59-56 and 58-56 for the tough Russian. With the victory, Zubov moves his record to 17-1, 9 KOs. Capers falls to 8-11-3.